It is located in the centre of Delhi and houses a number of museums. 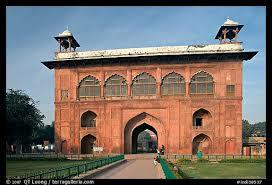 The vaulted arcade of the Chhatta Chowk ends in the centre of the outer court, which measured 540 by 360 feet 160 m ? 110 m.The side arcades and central tank were destroyed after the 1857 rebellion. In the east wall of the court stands the now isolated Naubat Khana also known as Nakkar Khana, the drum house. Music was played at scheduled times daily next to a large gate, where everyone except royalty was required to dismount.